A generator set is a complex noise source that includes the cooling fan noise, the engine noise, and the exhaust noise. Effective noise treatment has to address all of these sources of noise. For the most part, the recommended noise treatment methods modify or redirect the path for the noise from the generator set source to people hearing it. Simply using a critical grade muffler may or may not do anything to reduce the noise level at a specific location. Because noise is directional, careful consideration needs to be given to the location, orientation, and distance of the generator set with respect to property lines or places where the noise may be objectionable. In North America, state and local codes establish maximum noise levels for given areas. Most community noise regulations specify the maximum allowable noise level at the property line. Table-1 shows some representative outdoor noise level regulations. Generator sets, regardless of application, may be subject to engine exhaust emissions regulations on a local or national level or both. Compliance with emissions regulations usually requires special permits. Certain localities may have specific designations requiring gaseous–fueled engines and/or exhaust after–treatment strategies for diesels. Check with the local air quality agency early in the design phase of any project for permitting requirements. Table-2 includes typical diesel exhaust emissions for 40–2000 kW generator sets with untreated exhausts which can be used for estimating purposes. 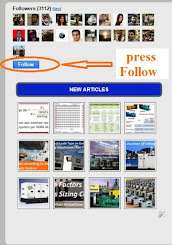 Consult the engine manufacturer for detailed information on specific product. Fuel supply tank design and installation in many areas is controlled by regulations that are generally written for two separate purposes: environmental protection and fire protection. In North America, environmental protection regulations generally exist at both federal and state levels. Different sets of regulations apply to underground vs. aboveground fuel storage tanks. These regulations cover design and construction standards, registration, tank testing, and leak detection. They also cover closure requirements, preparation of spill prevention plans, provisions for financial responsibility, and trust fund coverage. In North America, fire protection regulations typically adopt or reference one or more of the National Fire Protection Association (NFPA) standards. These standards cover such requirements for indoor fuel storage capacity, fuel piping systems, the design and construction of fuel tanks, fuel tank locations, diking, and/or safe drainage provisions. Refer to NFPA Standard No. 37, Installation of Stationary Engines. Local fire authorities may have more restrictive requirements or interpretations of requirements than those in the national standards. Generators that are used for emergency and standby power should be protected from fire by location or by the use of fire–resistant construction in the generator room. In some locations, generator room construction for installations that are considered to be necessary for life safety must have a two–hour fire resistance rating. Some locations will also require feeder fire protection. Consider use of automatic fire doors or dampers for the generator room. The generator room must be ventilated adequately to prevent buildup of engine exhaust gases or flammable fuel supply gas. The generator room should not be used for storage purposes. Generator rooms should not be classified as hazardous locations (as defined by the NEC) solely by reason of the engine fuel. The authority having jurisdiction will usually classify the generator as a low heat appliance when use is only for brief, infrequent periods, even though exhaust gas temperature may exceed 1000°F (538°C). Where exhaust gas temperature may exceed 1000°F (538°C), some diesels and most gas engines may be classified as high heat appliances and may require exhaust systems rated for 1400°F (760°C) operation. Consult the engine manufacturer for information on exhaust temperatures. The authority having jurisdiction may specify the quantity, type, and sizes of approved portable fire extinguishers required for the generator room. A manual emergency stop station outside the generator room or remote from a generator in an outside enclosure would facilitate shutting down the generator in the event of a fire or other type of emergency. Typical liquid fuel systems are limited to 660 gallons (2498 liters) inside of a building. However, the authority having jurisdiction may enforce much more stringent restrictions on the amount of fuel that can be stored inside a building. Also, exceptions may be made to allow use of larger amounts of fuel in a generator room, especially if the generator room has properly designed fire protection systems. Fuel tanks located inside buildings and above the lowest story or basement should be diked in accordance with NFPA standards and environmental regulations. The generator should be exercised periodically as recommended under at least 30 percent load until it reaches stable operating temperatures. It should also be run under nearly full load at least once a year to prevent fuel from accumulating in the exhaust system. The wye phase connection has a neutral point, often connected to ground. The wye configuration is used with three-phase loads or line to line loads. In a wye connection, the terminal voltage is 1.73 times the terminal to- neutral voltage. The Delta does not have a neutral point. Delta connections are used with single phase and three-phase loads. for example; the delta connection is sometimes used to obtain single phase 120-240 volts, 3-wire, along with three-phase, 3-wire on the same generator. A delta connection would have the same terminal-to neutral voltage as the wye connection for its terminal voltage. The delta line current (I) would now be 1.73 times the wye line current (I). Delta connections are found in rural communities where three phase is not available. A generator can lose up to half of its rating if a delta configuration is hooked to a three-phase system. 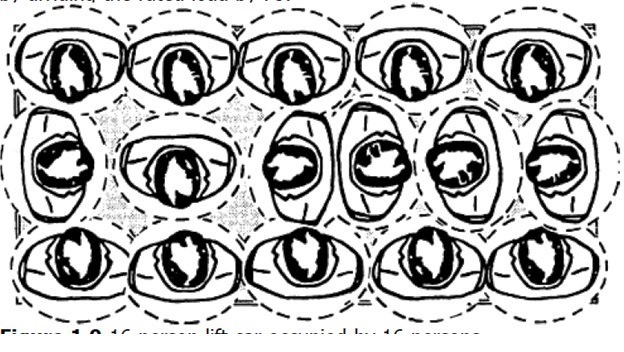 A wye connection can be structured in the two ways; a fixed neutral connection or a broken neutral connection. The broken neutral allows you to reconfigure from a wye to delta and vice-versa. It also provides differential protection by allowing the machine to monitor the currents into and out of individual phases. An open delta is reconfigured from an original delta from three-phase to single-phase use; this type of connection, however, will only provide approximately 57% of the original three. 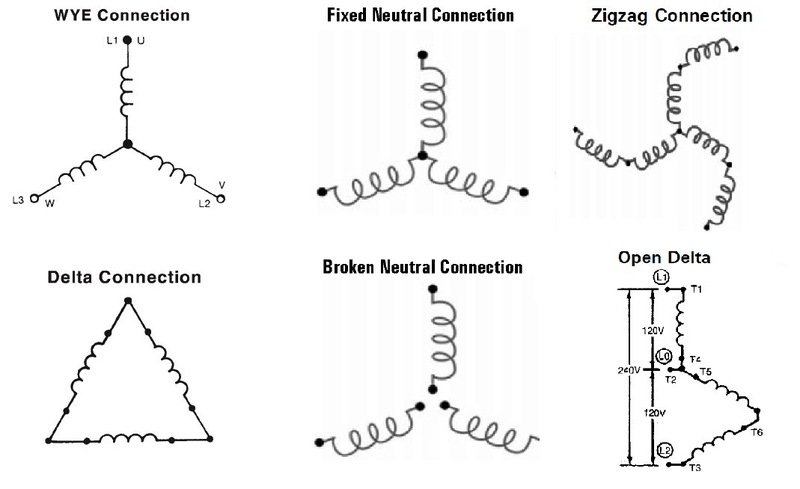 The zigzag connection is sometimes used to get an alternative voltage from a generator. For example, the connection shown in Figure 18 can provide 120-208V from a generator wound for 120-240V. 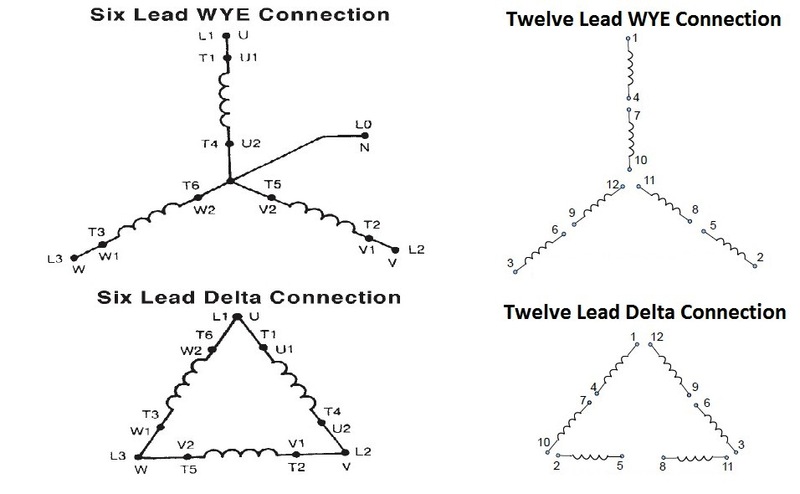 Generators with 12 leads can be connected in delta configuration. Larger generators use more than one wire per line lead. This feature eases the problem of forming very heavy conductors inside a limited space for terminal connections. All leads are identified. If more than one wire is used per line lead, a line lead number identifies each of these wires. Thus, on smaller generators, there would be only one wire marked T1. However, on larger generators, there will be two or more wires marked T1. These are to be connected together to form one lead. A twelve-lead WYE connection is the most common in North America. It allows the most versatility because of the multiple configurations allowed. 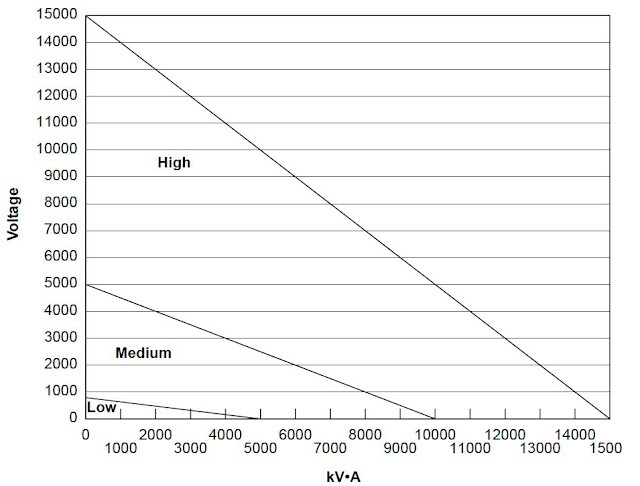 Figure.3 shows a voltage versus kVA chart, indicating low, medium and high voltage selections. 120/240V 3 phase, 4W Delta. Should not use on generator as it overloads 1 phase if there are large 120 volt loads. This is the least desirable voltage to use if there is a large amount of 120 volt load. The generator cannot be balanced and may overheat the windings. Advantages are 240 volt motors and equipment are more common than 200 volts.